With its constant activity and mild climate, Barcelona is perfect any time of year. The city is abuzz in the summer, and sunny and warm at Christmas time. 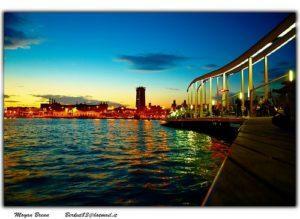 Barcelona is a clean, modern and open city, and its palm tree-lined streets suggest an endless tropical vacation. Its culture is contemporary, intertwined with a deep history and quaint architecture; featuring the colorful and sparkling mosaics of Antoni Gaudi. Its charm and beauty would take an otherwise ordinary city into the realm of the extraordinary, but Barcelona is no ordinary city. Its distinctive central pedestrian streets, large markets, unique cafes, and cable cars will offer you an unequaled destination experience. Las Ramblas This rambling, tree-line street is mostly pedestrian, and is one of Barcelona’s many attractions. Vendors, shops and accommodations flank its path. Musicians, mimes and living statues entertain and delight the passersby. 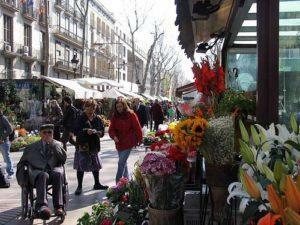 One of the most tantalizing areas of Las Ramblas is the Mercat de Boqueria. This enormous open-air market is full of tables heaped with fresh fruits and vegetables, fresh fish and meats, and flowers. If you’re on a tight budget (or just want a local experience), simply buy a bag of tomatoes, creamy cheese, and a fresh loaf of bread, and have a picnic in the park later on. At Parnasse, you can warm your belly and tantalize your mind with a taste of absinthe. Almost any restaurant you pass will offer delectable tapas, small appetizer-style dishes like olives, manchego cheese, and Spanish tortillas, leaving you satisfied and wanting more at the same time. Be sure you make time to stop at El Bosc de les Fades (The Fairy Forest). This café is hauntingly whimsical and dreamlike; the dark interior, complete with a starry night sky and gnarled trees, makes you feel as though you’re part of a fairy tale. Small caves, waterfalls, and fairies peak out from around every corner. The stunning architecture by Antoni Gaudi that is nestled in and around Barcelona is truly unforgettable. The Casa Mila, better known as La Pedrera, a mixture of Willy Wonka and Dr. Seuss, with bright mosaic facades appears to undulate in front of you; that’s because the front of the building is shaped like a wave. Visit the rooftop to walk amongst the vividly colorful gargoyles. 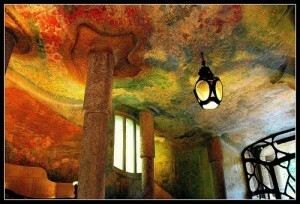 Park Guell is one of the most intriguing areas of Barcelona. Walk up a massive double staircase alongside a mosaic dragon to enter the park (entrance is free, while a fee is charged to tour Gaudi’s home). At the summit of the park is an overhang with panoramic views of the city, bordered by a long, curvy mosaic bench. Christmas is a significant holiday in the Spanish culture. Every year, several Christmas markets are held throughout the city, but one of the largest is located at the square in front of the Barcelona Cathedral. The market runs for almost a month during the Christmas season, making everyone feel festive and lively. 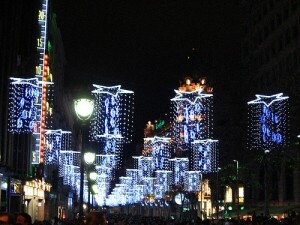 Cheerful lights line many of Barcelona’s streets, and the city has even showcased its “greenness” by adding solar and bike-powered Christmas trees to its repertoire of holiday decorations. Visiting Barcelona makes you smile. The entire city seems to invite you in; it doesn’t take itself too seriously. Perhaps that is why it is an ideal place to spend the Christmas season. 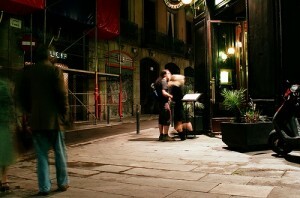 With its whimsical atmosphere and tongue-in-cheek traditions, Barcelona is a treat for adults and children alike. Rosa Scully the author of the “Barcelona: Jewel of the Mediterranean” is an avid traveler, and currently works as a content contributor for Santa’s Quarters, a retailer of commercial Christmas decorations like Christmas trees and more. Photo Credits: Barcelona waterfront: http://www.flickr.com/photos/aigle_dore/5238702708/in/photostream/; Las Ramblas: http://www.flickr.com/photos/oldbarcelonaflats/4504459537/; Hidden Cafe: http://www.flickr.com/photos/petergutierrez/4112728954/in/photostream/; Gaudi’s La Padrera: http://www.flickr.com/photos/27994521@N06/3595275284/; Barcelona Christmas: http://www.flickr.com/photos/thisduckhere/3101026710/.